This red lentil pizza crust is crispy on the edges, firm but tender in the center, and hearty enough to hold a lot of toppings. Since it’s made entirely from red lentils, it’s also naturally gluten-free, grain-free, low in carbs, and high in fiber and protein. The best part? It doesn’t require any rolling. I don’t know about yours, but my family LOVES pizza, Tanner (my husband) especially! I have actually never seen anyone like pizza as much as this guy. Sometimes I wonder if he would be happy if all he had was pizza (and mac & cheese) for the rest of his life. As Tanner says, if he’s having pizza twice a day, it’s a good day. When I first met Tanner, he would eat pizza for lunch and dinner. At that time we were both attending university and had pre-paid meals at the university culinary center. I pretty much lived on salads (because I found all the cooked meals very unappealing) and Tanner lived on pizza. When we finished university and moved out of the dorm, I started cooking my own meals and Tanner started buying frozen pizza. The kind that sells for less than $3 and has many ingredients you can’t even pronounce. Obviously, not the best choice. So, I bought a pizza stone, a pizza peel, and delved into pizza making so Tanner could enjoy a healthier pizza. Well, to this day, Tanner says that my pizza is the reason he married me, haha. So, here is a pizza recipe that is on a regular rotation in our house now. It’s not the same recipe that won Tanner’s heart, but it’s delicious nonetheless. (In case you’re wondering, yes, Tanner does devour the whole pizza every time I make it). 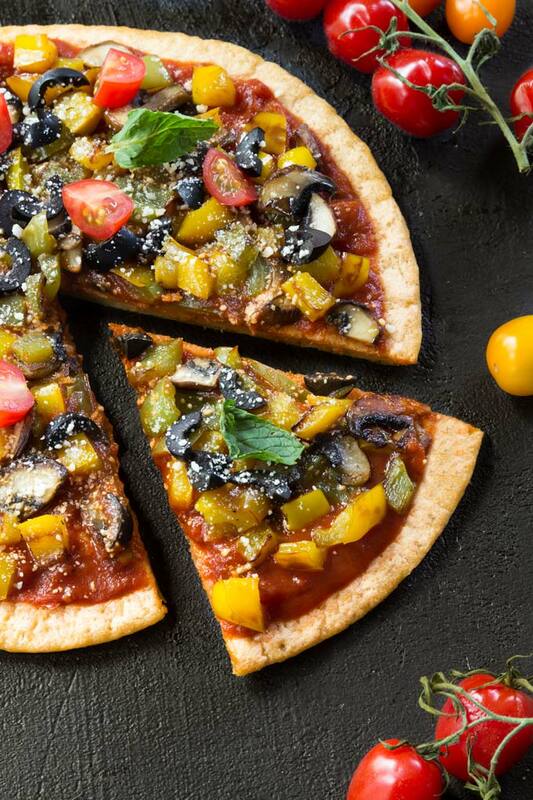 Red lentils make the perfect base for this vegan and gluten-free pizza. The cuisines of India, Algeria, France, Italy and most of the countries that border on the Mediterranean all have their own special versions of bean bread – socca in France, farinata in Italy, and besan roti in India to name a few. While bean bread is traditionally made with chickpea flour, I am using red lentils for this pizza crust. The texture of the final lentil pizza crust is a cross between a crispy pizza and a semi-thick bread. It’s wonderfully soft in the center, with a lightly crisp and brown exterior. Like the best of foods, this red lentil pizza crust is wonderfully simple to prepare. It contains only a handful of uncomplicated ingredients: red lentils, baking powder, salt, and water. The baking powder helps the pizza crust to rise (just like regular pizza crust does) so don’t omit it. A little bit of salt, some of your favorite herbs (I recommend using Italian herbs), and voila – you’ve got red lentil pizza crust. The most time-consuming part of this recipe is soaking the lentils. Not only does soaking increases the nutritional value and digestibility of lentils, but it also gives the final pizza crust a wonderful, faint, tartness that complements the naturally earthy, nutty flavor of the red lentils. I have tried making this crust with unsoaked (dry) lentils and it works. However, the crust has a darker color (soaking diminishes the red color) and tends to crack (because unsoaked lentils will begin to absorb water and expand during the baking process). So whenever possible, soak the lentils for at least 4 hours before blending. Soaking the lentils ahead of time also saves you time later. If you’ve ever made traditional socca bread from chickpea flour, you probably know that the batter needs to rest before cooking. The reason is hydration – chickpea flour needs more time to hydrate than say all-purpose flour. Since red lentils are already hydrated from the soaking, there is no need to let the batter rest before cooking. Since I baked the pizza in a cast iron pan, I oiled the pan first to make sure the pizza crust doesn’t stick. If you’re using non-stick cookware or a silicone mat, feel free to skip the oil. If you’re using anything other than cast iron, non-stick or a silicone mat, line your dish with parchment paper to prevent the crust from sticking. Also, while bean bread is traditionally cooked over a fire, a broiler or oven can work nicely instead. This red lentil pizza crust is crispy on the edges, firm but tender in the center, and hearty enough to hold a lot of toppings. Since it's made entirely from red lentils, it's also naturally gluten-free, low in carbs, and high in fiber and protein. The best part? It doesn't require any rolling. Preheat oven to 400°F (205°C). Place a 12" cast iron pan into the oven as the oven is preheating so the pan heats up as well. Drain and rinse soaked lentils. Add them to the blender together with water, garlic, baking powder, and salt. Blend until smooth. You'll end up with a batter that looks quite thin and watery: That's okay, it's what you want. Remove the cast iron pan from the oven and add a little bit of olive oil to the pan. You want the bottom and the sides of the pan to be coated with oil so the crust doesn't stick. Pour the batter into the pan and put the pan back into the oven (onto a rack positioned in the middle of the oven). Cook the crust for about 30 minutes or until the edges turn golden brown. Remove it from the oven and let it cool. You should be able to remove the crust from the pan without any problems. Bring medium saucepan to medium heat, Once hot, add olive oil, onions, and garlic, and saute until translucent over medium heat. Add tomato sauce and tomato paste and stir until smooth. Add remaining ingredients. Turn the heat down to low-medium and allow the sauce to simmer for 30 minutes. Taste the sauce and adjust seasonings to preference. If you’d like a more concentrated tomato flavor, you can continue to simmer the sauce for an additional 15 minutes. Once cooked, remove the bay leaf. Bring medium saucepan to medium heat, Once hot, add olive oil, bell peppers, mushrooms, and salt. Cook until soft and slightly charred – 10-15 minutes. 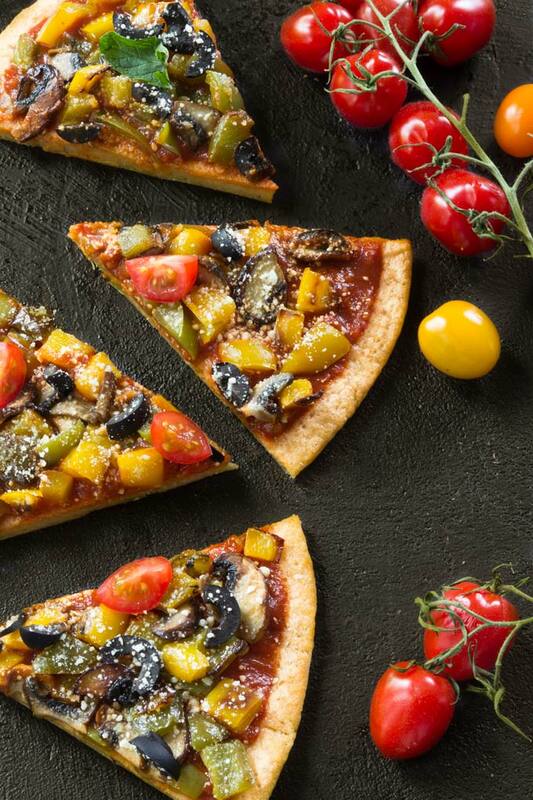 Top the pizza crust with the prepared pizza sauce, sauteed veggies, and cashew Parmesan cheese (optional). I also like to add chopped black olives. *Soak red lentils in water for at least 4 hours, ideally for 8-12 hours. If you don't soak your lentils, you will need to add more water when blending (about 3/4 cup instead of 1/2 cup). **You can find the recipe for Parmesan cheese here. ***Prep time does not include soaking the lentils (4-12 hours). – 5 min after I’ve put the batter in the oven it started cracking all over and finally split in two..
Any idea on how I could try again? Hi Federica – so sorry to hear that! I definitely do have a few tips. First of all, glass dish isn’t the best choice for making the crust. As you might know, glass is not non-stick. Both non-stick cookware and cast iron pan (that I talk about in the recipe post) are non-stick (cast iron is naturally non-stick when well-seasoned). 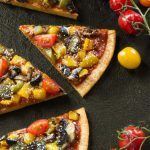 So when you use anything else – such as stainless steel or glass, you’ll have to line with either a silicone mat or parchment paper so the crust doesn’t stick. I am sorry I didn’t clarify this in the post. As far as the splitting of the crust goes, there are several reasons this might have happened – 1. the lentils were not hydrated enough (how long did you soak the lentils for? This is really important – if the lentils were not hydrated enough, they would soak up more liquid and expand during the baking process, leading to a crack. Adding more water to the batter would help prevent that), 2. your oven was too hot (every oven bakes differently. Next time you make the crust, start at 375 F), 3. positioning in the oven (where did you bake the pizza crust? The best is the middle or the bottom rack, not the top one). I know it’s a lot of info, but hopefully it helps 🙂 Please, let me know how it goes the next time you make the crust. In your recipe it states 3/4 cup red lentils, whilst in your video I can see you are using only 2/3 cup?? Thank you for your delicious recipes! Honestly, it doesn’t really matter. I have tried different water:lentils ratio and the recipe is very flexible. However, I do like 3/4 cup the best. The reason there is 2/3 cup in the video is that I am not very good at measuring when filming. I was standing behind the measuring cup when adding the lentils so I couldn’t see the measurements exactly. I did add a bit more lentils after I filmed that clip. Please, let me know if you have any other questions. Hello Petra, I am writing to you from Mexico. I saw this recipe on youtube and I thought it was crazy!I never thought it would came up as a pizza-like recipe. I just did it this morning and oh my Gosh! it really is like a normal pizza crust….you can grab it with your hand and you wouldn’t believe it is not a normal crust. I just replaced the red lentils with small chickpeas because I have never seen red lentils here where I live. I did everything exactly as you in the video only replacing the red lentils and I love you! Please never stop making videos and recipes especially vegan-paleo since it is kinda hard to find these kinda recipes. I used 3/4 of small soaked chickpeas with 1/2 cup of water. I think the exact amount of water is not that important, as long as you don’t get a very very liquid batter. I put a non-stick oil to my oven container called: PAM Canola Oil Baking Spray with Flour, which I bought at Walmart. If I put only oil it will stick like hell, but with this spray it doesn’t stick anything at all. I have also used it with different recipes: cookies, bread, etc. and nothing sticks to the oven plate or glass container. I am still in shock with this recipe….never thought it would came out so great! I tried your pizza, I should start to actually read recipes and measure everything…but it turned out well nontheless! I made approximately trice the amount and my kids (2 and 3 years old) and my husband really enjoyed it. It tasted sooo good I had a guilty conscience although I knew that there weren’t any “bad” carbs or dairy products hidden. I am really curious about your langos adaption – if you decide to share it! I totally understand – I have been very blessed with great appliances. I got my Vitamix from Tanner’s (my husband’s) grandma, the food processor was a wedding gift (I asked everyone to contribute money to it 🙂 and my air-fryer was a birthday gift from my parents. The only thing I purchased was the ice cream machine…I could not live without my Vitamix though so I think you made a great investment (even if your blender doesn’t turn out to be as powerful as Vitamix). Oh my – a third child! I don’t think I could do it. I feel so busy with two already!!! Making this right now and can’t wait to eat it! Question, my batter wasn’t runny with just 1/2 cup water and I added some more. In the video is looks like you have way ore than 1/2 cup. How much water did you add? Hi Erina – I did use just 1/2 cup, but I had the lentils soaking for a long time. I find that the soaking time really influences the amount of water you need. The longer you soak the lentils, the less water you need. I tried the crust with unsoaked lentils a few times and ended up using much more water than just 1/2 cup (can’t remember how much exactly). How did the crust turn out? I added a little more water and mine soaked for 24 hours. It was wonderful! I had to turn down the temp on my oven to 375 like you suggested because miensterted cracking. I have made this recipe several times and it is now almost a weekly staple in our home as well. Thank you for sharing! I´m writing you from Hamburg, Germany. Your work is so inspiring and wunderful! Thank you for this so much! Mi cuestion: Would it be possible to make the Pizza Crust with red lentil Flour? I couldn’t wait to try this pizza. 🙂 Well, I tried it today… I soaked the lentils for at least 12 hrs… probably 18 hrs.. from 4pm yesterday to 10am this morning. I used a cast iron skillet… I added a little more than 1/2 cup of water to the mixture, probably 2/3. After I put it in the oven, I’m not sure when cracking began but 20 mins into the cooking, I noticed it… since I was doing other things. I think that I probably needed even more water. My crust (even though I used 3/4 cups of lentils or slightly more) was thick like a dense bread consistency. If I try this again, I will set the oven lower than 400, maybe 380F and add a little more water… Please let me know your thoughts Petra. Hi Ada – I am yet to figure out why exactly the crust cracks. I always thought it’s just because of soaking (not soaking the lentils enough, that is). But there must be another factor because there were a few people who messaged me saying that they skipped the soaking and their crust never cracked. My first question would be what lentils you used. The type of lentils you use play a huge role because red lentils are very delicate and soften up easily. Other varieties need more water and cooking time to soften up. I tried the crust with another type of lentils (I think it was brown/green lentils – not sure anymore) and it did not work for me at all. A second question – did you oil the cast iron pan at least a little bit? I find that it helps with cracking as well because if the crust sticks to the bottom of the pan, it also tends to crack (because it can’t expand as easily). Now, the consistency – it definitely shouldn’t be like a dense bread consistency. It should be pourable (just like in the video). If you need to add more water, add more water. Have you ever made socca bread? It should have the same consistency. Again, the amount of water will vary depending on what lentils you use and how long you soak them for. (Soaking shouldn’t be an issue in your case since you soaked the lentils for 12 hours). Please, let me know if this is helpful and don’t hesitate to reach out if you have any more questions. Again huge thanks for this recipe! It has become a staple in our house. The lentil crust is so easy to make because it doesn’t involve dough rolling. We also made crackers from this crust just making a thinner layer and adding some seasoning and nutritional yeast. The color is also amazing. You are a real innovator in the world of vegan and gluten-free cuisine. Please continue to amaze all of us!!! Thank you so much, Marjo! So happy you’re enjoying my content ❤. I appreciate you taking the time to comment! Have you ever made multiple crusts at once, then froze them for later use? Does the reheating work well? HI Bec – I have not tried freezing the crust, but I suspect that it would be similar to freezing socca bread. (That is, putting it in an airtight container/bag and freezing). When ready to use the crust, reheat it in a 250º F oven for 5-10 minutes, preferably on a pizza stone. Again, I haven’t tried freezing it, but that’s what I would do if I needed to make the crust ahead of time. Hello from Sunny South Florida! 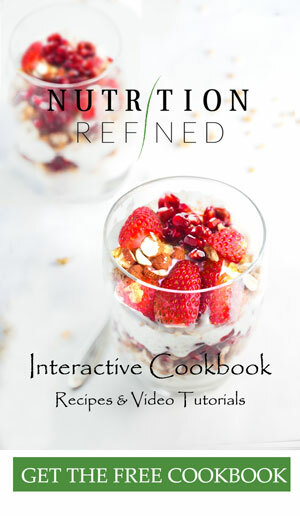 I just found your site and I’m anxious to try out your unique recipes. I am switching my family to a plant based/raw/fermented lifestyle. I just made your pizza and my family loved it! This pizza crust will now be my easy “go to crust.” I always have something soaking around the house so the soaking wait is not a problem. Also, I never knew about the silicon reusable bags until your site. I purchased some from your store yesterday. Thank you! Thank you so much Felicia for the kind comment, Felicia! Haha, I am the same. I always have several bowls with different legumes and nuts soaking and/or fermenting around the house 😉 A few people commented (not sure if it was on my blog or my YouTube channel) that they made the crust with unsoaked lentils no problem. However, my crust always cracked when I didn’t soak the lentils so I will have to figure out why that is! I had an attempt at making this tonight…My problem was I read the recipe wrong and added all my 3/4 cup soaked lentils–which had expanded to nearly 2 cups of soaked lentils…Silly me! No wonder the mixture was thick…I realized my mistake afterwards but just crossed my fingers and added more water and some more baking powder. Basically I think I made a double batch. I poured in about half the mixture into my pan and set the timer…Much to my surprise it turned out great! Bit of a thicker crust because of my error, but lovely and crisp on the bottom and chewy in the middle and IT WASN’T FLOPPY. (I’m looking at you cauliflower crust! ) Kind of reminded me of injera…Can’t wait to try again properly haha! Fabulous recipe. I’ve prepared the red lentil pizza crust in the past but I’ve never soaked the lentils. No doubt this was the better of what I’ve attempted.. I love the texture, the flavor, and the amount of protein. Worked well with my cast iron pan. Thanks so much for the recipe! Dear Petra! thank you for this recipe! I appreciate that in your house, this pizza evaporates when you make it 🙂 Is it possible to make the base and keep it in the fridge for 24-48 hours then add the sauce and toppings and cook them when you want to use them? Although I’m oil free, I really love your recipes and am gradually working my way through the compatible ones! Please keep up the good work! Hi Matt – did your daughter try it or she wouldn’t even do that? My daughter (almost 3-year old) goes through phases. There are days she LOVES a certain recipe only to reject it the next day. I try to get my daughter involved when preparing meals as much as possible. I find that when she makes something, she is much more likely to eat it. So, for instance, when making this pizza, I would ask her what herbs she wants in the crust. I would also let her choose the toppings, and she would then put them on the pizza … she also loves to blend things and stir. Sometimes I talk he through the ingredients as well. I found that when she doesn’t know what a certain dish is made of, she won’t touch it. So, I would show here the lentils, the water, the salt, etc. and I would even ask her – “would you like me to put it in there”? I think you get my point. There has actually been a study indicating that children are more likely to eat what they prepare themselves. Have you asked your daughter what exactly she doesn’t like about it? My daughter is only 3, so she wouldn’t be able to tell me. She would just say “I don’t like it”. Is your daughter able to tell you what she doesn’t like? Too salty, too difficult to chew, … ? Hi Petra, thanks for such great suggestions! She always tries things now because I’ve managed to instill the approach where I ask her to try a new dish with no obligation or pressure to eat it if she doesn’t like it. This time she told me she liked it after the first mouthful, then at the second one, changed her mind. I scraped off the toppings and she just ate those, so it was definitely the base. I asked her what it was, but she wasn’t in the right frame of mind to give me any real feedback. I also involve her in cooking and baking as much as possible – even to the point of taking her the shops as I also want her to understand that the things in the cupboard don’t just magically appear. This time, it wasn’t possible, but my experience with her is that she will try things anyway, and then decide whether she likes them or not. On the plus side, my girlfriend told me that the one I made for her was better than a classic pizza base! 🙂 So I’m soaking more lentils now for her!! Thanks once again: there are so many of my the people around me who don’t bother in the kitchen – it’s lovely to chat this through with a like-minded person! This is the best crust ever. Have gone gluten free now for almost a month and was missing pizza! The only problem I had was removing crust from cast iron pan. I had oiled it…but maybe not enough….It took everything to be able to take it out without breaking it. There was also a layer of dough stuck on the bottom. Could I line pan with parchement paper next time? Would that work? Hi Sandy – I am happy you liked the recipe 🙂 Hmm, you said you used cast iron pan. Cast iron should be naturally non-stick (when it’s well seasoned). So, the batter shouldn’t have stuck to the pan … but obviously yours did 🙂 what brand do you have (if you don’t mind sharing)? Anyway, yes, I would try parchment paper. If you’re using parchment, you can even use a baking sheet (if that’s more convenient). Parchment paper is also non-stick, so it really shouldn’t stick. 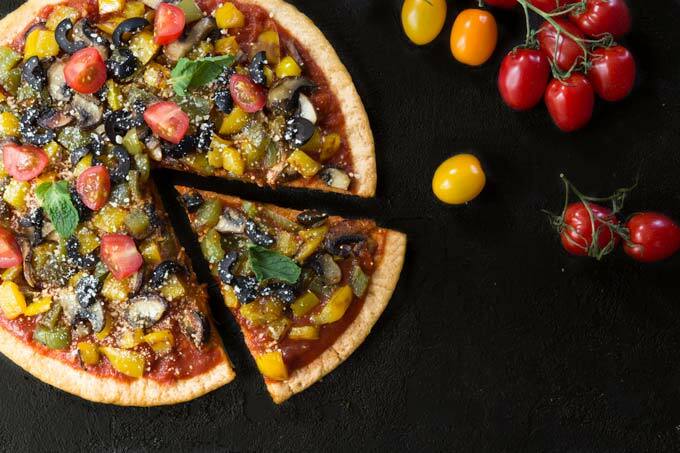 Τhis is the most amazing healthy pizza crust I have ever tried! When I was preparing it, I couldn’t help thinking if this will really work, but it does and it tastes great! This is one of our family favourites now! I made this healthy and special kind of pizza! Of course the dough is not like as a usual one from flour and yeast, but the taste is very good, tender, and it’s a great way to eat something new, tasty and so healthy! What I like in all your recipes, Petra, it’s that the dish come very yummy and so light for my digestion! When I ate that pizza I wasn’t hungry at the end and at the same time I was light with great digestion! I mean it is a nutritious pizza dough! You can eat the pizza the second day as well. The taste and the texture remain the same! It’s convenient to eat not only at home and bring it with you on travel and walk! Great idea for breakfast, lunch and dinner! Thank you, Petra, for the recipe!!! Hi Petra made the pizza base and it stuck to my pot, the pot is still soaking. The leftover base mix i made like pancakes in a pan. O boy it was amazing. mixture. Thanks for another amazing recipe the flavor was amazing thanks. Hi Geraldine – what type of pan did you use? You need to use well-seasoned cast iron (which is naturally non-stick) or non-stick pan for the batter not to stick. Was your pot stainless steel? Hi Petra – just wanted to thank you for the recipe. The crust turned out so well. Exactly the way you described. My entire family loved it. Hi Petra! I found your blog recently and it is the best. Great work you are doing, thank you for the recipes. I love them all but this one is perfect!!! Croatia is beautifull. Hope you will enjoy here! This is now my family’s go-to gluten free pizza crust and sauce recipe. I spread the crust batter on a pizza stone covered with parchment paper and water-sautee the onions and garlic. The sauce tastes great without oil. One time the crust cracked when I soaked the lentils a long time. The most recent time I did not soak the lentils and used 3/4 cup water, and it turned out crispy and delicious! Hi Melissa – thank you so much for the feedback! So happy you are enjoying the pizza crust 🙂 How interesting – I had the crust crack only once and it was when I didn’t soak the lentils. I wonder if there is another factor (there must be!) that plays a role in the crust cracking. Did you change anything the last time you made the crust? (oven temperature, type of lentils, amount of water …). I will have to do some more testing and see if I can figure it out. Wow! The pizza turned out AMAZING! Easy to make, inexpensive ingredients, and crust is crunchy on the outside and soft in the center, as you promised. I made the pizza crust a while back and left high remarks for the taste, ease and texture. So, this is my second HIGH FIVE reply after pouring the lentil mixture a bit thinly into my hot pan. As it turns out, this thin ‘crust’ makes incredibly fabulous crackers! (Not sure if anyone else has had same experience). I added some dried oregano to the soaked lentil batter but this was the only change. Absolutely phenomenal…what a nice revelation. I’m totally blown away! Thank you so much for sharing your experience, Ida! I had no idea I could make crackers out of it. I am trying this tomorrow!! Absolutely phenomenal! I stumbled across the cracker recipe incidently as I made more batter than intended. Doubled the recipe but poured one crust a bit on the thin side. Totally flavorful, crispy and made for crackers or crispy flatbread! Happy accidents 🙂 So happy to hear that I can now make lentil crackers … I am making them right now! So excited!! Love this recipe! This is my go to pizza crust. Super easy, and pretty foolproof, healthy, plus it tastes great and holds the variety of toppings I decide to put on it, really whatever leftovers are in the refrigerator. My husband, meat eater, loves it, too. I usually add some Italian herbs when I blend it. I also spread it out on a silicon mat, no problems with sticking. I make this about once a week. Thank you so much for the feedback, Cathy! ❤️ My husband LOVES white flour pizza crust with any toppings you can think of, but really enjoys this lentil pizza crust too. I didn’t think he would (since he is so used to the “regular” restaurant-style pizza crust), but he really does! So happy your husband enjoyed it as well!